Great Berry played for the first time in a full 7 a-side Netball Rally at Marshalls Park School. The Year 6 team came 4th in their 'A' Team section. They played very well and had some close games against some excellent teams. The Year 5 team won every game in the 'B' Team section and came out overall winners, winning the cup. 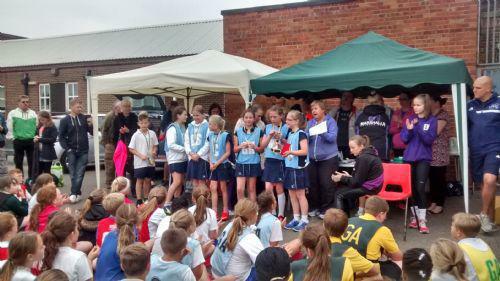 A fantastic first trophy for the Great Berry Netball trophy cabinet! CONGRATULATIONS TO THE YEAR 5 TEAM! An extra well done to all the players in both teams as several people commented on the fantastic attitude of both our teams. We won a few friends today! !